Notes: I usually frost just the top right in the pan with my 2-Minute Chocolate Frosting. For the recipe click here. 221 Comments on "Quick & Easy Chocolate Cake"
Jenny, you are such a lovely lady. i’m 42 years old now and i remember seeing you years ago, when you had your talk show. i recently came across your cooking site and recognized your picture and realized you were the same lady and since then, i’ve read a lot about you and all that you’ve done ..and continue to do. you are just absolutely a beautiful lady, inside and out, it seems…such a wonderful human being. may you continue to be blessed in all of your endeavors. and i’m sorry for your loss on losing your sister, so suddenly. i love your cooking site, i think it’s wonderful, i’m getting ready to make the chocolate cake. thank you for all that you do and sharing your yummy recipes. And it was amazing. Crunchy on the outside and soft on the inside. This recipe will not “print” so I wrote it out by hand. Please see the FAQs for any printing problems. No oil and no sugar, it came out awesome, so moist, everybody loved it. This is my kind of cake from now on. I would like to see if it could be done white cake, any suggestions. When I was growing up I had a wonderful lady in my life that taught me how to bake . I’m so thankful for her! She has long gone but I know one thing she taught me was to drop the pan on the counter to get the air bubbles to rise so there wouldn’t be any voids. Have you found air bubbles in your cakes? … I forgot to mention I also replaced the Canola oil with unrefined coconut oil. Cake was deeelicious. I tried out this recipe because it seemed so good and was simple. I added 1 tsp of espresso powder to the cake’s dry ingredients. I made the frosting, also. It came out fantastic tasting and moist. So chocolatey! The frosting was delicious. I wasn’t holding out much hope as sometimes on- line recipes don’t come out like I expect. I’ve since printed Jenny’s cinnamon roll recipe and the platski (?) Polish filled baked donuts recipe to try. Thanks Jenny! Oh my, this a delicious chocolate cake! It’s not to sweet and we love that. My husband ate most of and has asked for another one!! Thank you for sharing your recipes with all of us!! This is the second time this month I bake this cake…ITS THAT GOOD!! I used to watch your show years ago and really enjoyed it. I recently found your cookin videos on you tube, and am blown away at your recipes they are all winners. Thank you for how you make them so easy and fun. All I can say is I searched and searched and experimented with a plethora of “vegan chocolate cake recipes” and………. Jenny’s one bowl vegetarian chocolate cake is so……. adaptable! *fresh ground hazelnut,*clove, and *flax seed. Then I couldn’t resist I stirred in six fresh ground almonds to the 1-cup of milk. Oh my it smells so……… good in my home right now! I just took your cake out of the oven. I made the chocolate cake today and it’s perfect,,I did not put cocoa in the icing I left it vanilla and 1 cup of confectioners sugar was just the right amount, the icing is sweet but not overpowering because it is not too thick on the cake. I left mine in the pan, I also put sprinkles on it. I made this cake today 2/12/19 and I followed the instructions. I used Pink Salt b/c that was all I had and I baked the cake in a square pan because I didn’t have a round one. The cake turned out perfectly. I’ve never made a cake from scratch but this recipe was so simple and easy I decided to give it a try. I frosted the cake with frosting from a tub which was fine. It’s an easy recipe and one I intend to keep. Love your YouTube channel…it brought me here. I made this cake for my daughter’s birthday and she loved it. I am making this again right now…for no reason other than it’s fast and delicious. I love that its vegan also…just a plus. Love your recipes. Thank you. Ok, I wanted to make a scratch cake for my wife’s 52nd birthday, this was the winner. I wanted to make it special and give Jer favorite things, chocolate cake, and ice cream. I made an ICE CREAM CAKE! WOW it was so good. Made one cake, removed and place on cake plate, drizzled, no poured on scrath chocolate genash! Placed the other, pre made homemade ice cream. Which was pre formed into the other cake tin, and poured on more chocolate, and dipped some strawberries, in the chocolate of course, and froze. I was desperate for chocolate cake and this recipe looked easy enough. I didn’t have lemon juice or vinegar…buuuut I did have Kroger brand lime juice from concentrate so I took a gamble and it came out a winner! Perfect, delicious, frosting was yummy, too. Raves all around. Honestly, if it came out as a chocolate pile of mush I would have still eaten it. Desperate! I made this cake this afternoon having friends over for dinner. I wanted to cut a piece, my husband said no. I will check back to let you know how mine tastes. I did notice my case was a little flatter then your? I love how easy it was to make. I love your sense of humor. It on posting you delicious recipes. I make your snow ball cookies for Christmas they were good. This is easy and delicious. Just found your videos the other day. Made this chocolate cake. It is perfect. Just enough for my hubby and myself to get a chocolate fix without having to eat cake all week. My husband asked where was the second layer. I told him to have a bigger piece. Loved it. I don’t know why anyone would have a problem with this easy recipe. I have made it several times and it’s perfect every time. None of your recipes have ever failed me, jenny. Luv you! Sugar gives baked goods structure so you may want to look for recipes that are proven to work with stevia. I found your recipe and decided to give it a try. I’m not sure how you came to a 30 minute bake time. After 30 minutes it was still very liquid in the center. I added an extra 10 minutes. Tested with a toothpick and still moist. Added another 10 minutes and it appeared to be done. After it cooled I cut into it and I am still found a moist/liquidy area. My stove/oven is gas and fairly new. I can’t explain why my results did not come out as hoped. If you can list all the ingredients you used and the size of the pan, as well as your method, I will do my best to help. I followed your recipe exactly as written. I aerated the flour as suggested. The pan was a 9 inch pan and I even used a pan liner. Based on your result, something different had to take place. I am sure I can solve the problem but I would need some details on your exact ingredients (even brand names would help) and your method of putting it together. What was your pan made of and what is the pan liner? You can see that this recipe has worked for hundreds of cooks and I’m sure we can solve this with some details from you. It could just be that your oven was not hot enough. Do you have an oven thermometer? Let me know because I want my recipes to work for everyone. Thanks. For the people who followed the recipe exactly but it didn’t turn out or took longer… I was thinking altitude may play a role in the reason why. When I lived in Wyoming over 6000 ft above sea level, I learned to adjust measurements of ingredients, oven temps and baking time after many failed and frustrating baking fiascos. Altitude really does make a difference. I wonder if Jenny is at sea level or higher up. That’s funny I had to add an Xtra 12 min. To mine too the it came out with the top hard and the middle chewy as brownies. Lol. Could hardly get a slice out of the pan. Lol. Thank you so much for the recipe for quick & easy chocolate cake. It was super easy, moist and delicious desert that I ever had. Thank you Jenny! I modified a bit – Used 3Tbs of Butter and 3Tbs Extra Virgin Olive Oil. Half a teaspoon of instant coffee powder! Fresh Baking Soda! Didn’t have lemon juice so used lime juice. I baked in bread loaf pan! (I don’t think the batter cares!) Mine required 45min of bake time for clean tooth pick! End result, Nice fluffy, double the volume, and moist!…..all disappeared in less than a day! moist did not even need Frosting. We are diabetic. Could you make this with truvia? Thanks for answering, love the video! I am so glad I found this recipe. I have a cookbook with the exact same recipe, except one ingredient was left out; the water. I couldn’t decide if I needed an egg or not so I used 3/4 cup water and 2 eggs. I’m looking forward to making it with just the water the next time. Jenny- you are amazing! Thank out for the clear instructions, no fail recipes that are delicious and healthy. Heard you have retired. Thank you or leaving a wealth of recipes and videos. Hope you are enjoying life! So far I’ve made your No Knead Rolls, Chicken Pot Pie, and now this Chocolate cake. Everything is delicious and so easy to make. I’m having so much fun trying your recipes. Cant wait to try another recipe. Dear Laurie. Sending gratitude to our moms and all the wonderful memories they left us. I miss mine too. But we are blessed that they left us with so much love. Blessings to you. Thanks for letting me know. We are looking into it. 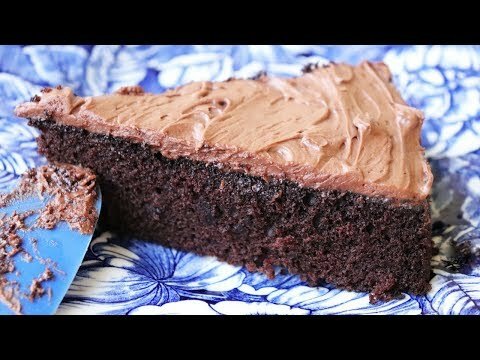 I’m going to try this chocolate cake recipe tomorrow but I was wondering if you can make an eggless vanilla cake recipe please? I’m searching all over YouTube but I just can’t find one that is healthy and perfect like your chocolate cake recipe! Can you please make a simple eggless vanilla cake and upload it? Thank you so much! I couldn’t believe some of the hilarious comments this go round. As always, you handle them with apparent ease. I admire you so much. I tried the easy chocolate cake recipe, substituting all purpose flour with gluten-free all purpose flour and the sugar with a combo of monk fruit and Stevia—about 2/3 monk fruit and 1/3 Stevia. I also used coconut oil instead of if light olive oil. Lemon juice in place of vinegar. The texture is perfect, but the cake has a sorr of burnt sour taste. Wha’ hoppened? Please let me know your thoughts. Thanks. When baking, sometimes even a small change can bring a disappointing result. It’s hard to say which of your changes caused it but I do not think it was the lemon as I have made this cake using both vinegar and fresh lemon juice. Many years ago, I gave this recipe to a friend………..When I spoke with her a few days later, she said she had made the cake, but that they didnt like it! When I asked her if she followed the recipe, she replied that she didnt use the vinegar because she didnt think it belonged in there! ok, no wonder it wasnt good………it wasnt all there! jenny, i made this yummy cake for my daughter’s birthday, the kids devoured it – none left for me!!! I make this delicious cake recipe often, yet, today, I goofed. Instead of adding 3 tsp of milk, I added 3 TBLS. As a result, I had to add more confectioners sugar, so it made a lot more frosting. What can I do with the remaining? Can I freeze it to use on the next cake? Or, just throw it out. I just don’t like to waste. I save the extra icing on the fridge, my husband loves to have a little treat of Graham crackers and icing… Or he will use nilla wafers…. I frost graham crackers and make a sandwich out of it,one on top of the other. Very good smack.Don’t ever throw it out.Hope you try next time. I see you’re a fan of the In the Sweet Kitchen cookbook. Page 407. 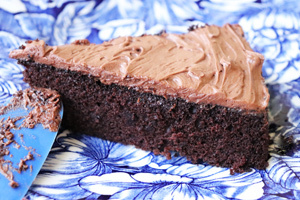 All-in-the-Pan Chewy Chocolate Cake with Chocolate Butter Icing. At least you changed the icing recipe a little bit. Can’t say that I blame you for using it. It’s a fantastic recipe. I started making this cake years ago as the 3-hole cake that was popular back then and finally made it into a one bowl recipe. This cake recipe, with only the tiniest variations, seems to be everywhere. If mine is exactly the same as another one I was unaware but with the number of food blogs on the web, I would not be surprised. Please let me know if you would like me to change my recipe. Please, don’t change your recipe. It is wonderful. You are a very gracious lady. Regan – Not sure if you realize it, but Jenny Jones has been in the spotlight for decades and is very reputable in her business and philanthropic efforts. Your post is presumptuous, rude, and narcissistic. Recipes have floated around for decades. Please don’t assume yours is the only original recipe and do not accuse others of lifting recioes from a book that, frankly, I’ve never even heard of. Jenny is a fantastic cook and a fine, upstanding lady. Agree with others. . . This was a tongue-in-cheek accusation! There are many recipes out there, and any mediocre cook might make changes or not to suit them. If this looks anything like the recipe that you reference, it may be coincidental. Be careful of accusations of plagiarisms! I have never heard of that book you referenced but I do think that this is a great Vegan recipe! Agree with others. . . This was a tongue-in-cheek accusation! There are many recipes out there, and any mediocre cook might make changes or not to suit them. If this looks anything like the recipe that you reference, it may be coincidental. Be careful of accusations of plagiarisms! I have never heard of that book you referenced but I do think that this is a great Vegan recipe! Who knows- maybe she created this recipe before the author (you???) did! Regan Sweet Self Promotion lol! Have watched Jenny for years and wonder which rock you crawled out from under to accuse her. Nice try to promote your cookbook that’s unheard of by many and now a lot of us have but will never buy it.Quit trying to use Jenny’s blog to garner support for your useless product – sorry nobody is interested so try buying google ads next time. This cake has been around for decades! It was called Depression Cake and was commonly made during the great depression when ingredients like milk, butter and eggs were then either expensive or hard to obtain.That was in 1929! Look it up. So where did YOU get this recipe, Regan?? I wanted to surprise my hard working husband with a cake. When I came across this one, I had the ingredients in my pantry. Can’t wait to try it with him! It’s also what I’m craving for: MMM….CHOCOLATE! ❤😋 YUM! I made this cake and I fell in love with it ! Thanks for the reciepe Jenny! Baked this cake today. It came out really really good.Thank you so much Jenny! Oh my goodness, Jenny you really can cook! This cake is amazing and my kids loved it! I didn’t have any vanilla on hand, so I used almond extract and it still turned out great. Will bake again, but with vanilla. I can’t wait to try your other recipes! I was looking for a egg free cake, came across yours & so happy I did! Made 4 layers for my daughters Peppa Pig cake. Tossed on two piggy characters & wah lah a very tall, chocolate muddy puddle. Thanks! I should have looked…you have us covered. Thank you…my next bake! Whole Wheat Carrot Cake Jenny Can Cook! Hi Jenny, Made this cake again and delicious. My question. Any chance this cake recipe can be made into a Carrot Cake or a Spice Cake? I think the Spice Cake would be pretty easy but the Carrot Cake puzzles me. Any thoughts? Can you substitute honey for Sugar and use less of something? I’m trying to get away from real sugar. I don’t know of any substitute that works without altering the structure of the dessert. Thank you Jenny for this wonderful recipe. I made it in a deep dish pie pan and it rose almost to the top. The cake is moist and chocolatey and delicious. The frosting turned out wonderful as well. My husband wanted seconds, it was so good. This is a cake I will make again and again. I love your chocolate cake recipe with no butter frosting. I was hoping that the frosting would be dairy free just like the cake. I could use dairy-free margarine to replace the butter, but what would you suggest to replace the milk. Almond milk or cashew milk is not an option as my granddaughter is allergic to all dairy and nuts. Can you help me? I have used soy milk in icing recipes; or since there’s a negligible amount of liquid you could probably just use water. This is a delicious cake. So good I always want seconds!! A suggestion for the glaze is adding 1/4 teaspoon of instant coffee, it really brings out the flavor of the chocolate. So yummy and good. 10 out of 10 would recommend. In your comment you said you used “1/4 teaspoon of instant coffee“ is that instant coffee powder, or actual coffee after it is “brewed”? I love ur recipes, ur tips and the presentation. Everything is wonderful. Can u post some tasty recipes suitable for diabetic people. Thank you. I just found you and this recipe. With one son allergic to eggs I always look for no-egg recipies and this was great! The cake disappeared into the mouths of teen boys in seconds. Served it with fresh rasberries. So yummy, thanks! I made this cake today and my husband and adult son who was visiting and they loved it. My son said it taste like something you’d order in an expensive restaurant. I just used a throw away aluminum round cake pan. The cake was easy to make and the frosting was a snap. I am so happy I found your YouTube videos and website. I just love your recipes! I’ve made many of them and they are all winners. When I first saw one I knew you looked familiar. I used to watch your talk show all the time. Note: I use organic Equal Exchange baking cocoa from Amazon.com in all my recipes calling for cocoa and it’s wonderful. I’ve followed the exact recipe you showed but i have no idea why my cake are so small than yours?its but thick too.i wonder why? Pls help..thanks alot! Can you please list (exactly, by brand) all the ingredients you used, what you used to mix, and the size of your pan and I will try to help. I made this cake , I didn’t care for it at all. Can you say ‘why’ you didn’t like it. That would be helpful. Lemon juice or distilled white vinegar: I’d have never imagined! I cook every day, but have rarely baked, especially for the last 20 years, so I haven’t read that many cake recipes to know. Is this unusual, adding a tart acid, even just one tablespoon? How did you come upon this as an ingredient to add? Does it have similar effect (rising or leavening, possibly) as adding baking powder? I did not invent this method but you can get a more qualified explanation of how this works with an internet search. An acid is used to activate the baking soda. As well, 1 tsp of baking soda plus 1 tbsp of vinegar is often used to replace one egg in a recipe- so double whammy! Excellent recipe!! Added to my collection. I made this tonight for an early Mother’s Day treat for Mom. She loved it! Everyone at the dinner table loved it! The richness of the chocolate and the sweetness of the cake is just right. This is now my go to cake for pot luck parties. Thanks So Much for sharing this recipe! Sorry, I don’t know. You may have to research an answer. I made the cake again this time without the choco chips. It turned out lighter and more moist and I’m sure by tonight it will be all gone. I hope your cake turned out. Vanilla is important to include when baking with chocolate but I only use vanilla extract so I can’t advise on using pods. I suggest looking for any chocolate cake recipe that uses vanilla pods for the quantity and then you can try using them with my recipe, but vanilla extract is the more popular (and easier) form to use. thanks for your help jenny ,it did turn out good anyway. oh and I also added chocolate chips will this make any difference(apart from the taste)? Hi Jenny I just found this website and wanted to make this cake it is in the oven now. I love baking and I’m only 12 I cooked it without the vanilla though. Can you use vanilla pods instead? I don’t have any vinegar or lemon juice! Could I leave it out or no? No, you need the acid. I’m horrible when it comes to baking; cookies never spread in my oven and my cakes always taste doughy (like not cooked enough). I have a gas oven so maybe they heat differently than an electric oven. However I tried this one bowl chocolate cake and I had huge success!! I cooked it for 40mins instead of 30. And I followed the recipe exactly as it is, and it worked amazing! I’m a vegetarian so the fact that this recipe was eggless was pretty sweet. I’m officially a huge fan and I’d recommend this recipe to anyone who wants a healthy chocolate cake recipe. Thank you Jenny this recipe was a huge confidence booster for my baking skills! Every recipe I make is on this site. Tried this cake tonight and absolutely love it. It’s super easy to make and turns out nice and moist. I doubled the recipe and baked it in a 9×13 airbake pan. It took longer to bake since it was doubled, but the toothpick test worked perfect for determining when it was done. Thanks for the recipe Jenny. I’ll be making this again, probably without the frosting next time – just because I tend to find all frostings too sweet for my taste. Jenny’s frosting is pretty good though, even to me. Hi Jenny. your video was chanced upon when I was doing my bed time recipe ‘read’. Love how detail the video is and how engaging you made the viewers feel like a close aunt sharing recipes. I’m can’t wait to try your easy no knead crusty bread really soon before this Christmas. But what I had earlier were perfect for this all-in-a-bowl chocolate cake. I loved how easy it is to prepare and bake since as a working mom in Singapore, time is always a constant battle to include baking after tending to the needs of my children. The texture was great, moist in the inside and a little firm springy exterior with excellent color. The sweetness level was just perfect (I omitted the frosting and only dusted some icing super over it) but the taste seems a little ‘rubber-soda’ and would probably need a richer chocolatey taste like a melted chocolate? I used Hershey coco powder and bicarbonate soda. I would love to hear your recommendation. Thanks in advance! Try using Dutch process cocoa. It’s the only kind I use because it’s darker, richer, and never bitter. Can I use apple cider vinegar instead? This great recipe for vegan people. Thank you so much for all great recipes. Yes, I have seen recipes for this kind of cake using cider vinegar. Hi Jenny, I made this cake and its turned out moist and soft but slightly bitter. I am not sure what it could be. I used lemon juice. I don’t think it’s the lemon juice but more likely the cocoa you are using that is bitter. I recommend Dutch process cocoa because it is never bitter. Assuming you followed the recipe EXACTLY, the cocoa is likely the problem. If you can’t find Dutch process, perhaps you can try a different brand. I made this today for my spouse’s birthday. We don’t like to have a lot of sweets around the house for health reasons, but I thought this simple cake would be nice for a birthday treat. Wow! For a simple little cake it’s quite the delicious treat without the high fat and cholesterol. At first I was wondering if maybe I should make double the frosting and cover the whole thing. I discovered that the layer on top is plenty as the frosting tastes amazing! Both the cake and the frosting taste very rich. It was quite the treat and we both loved it. I made it in a spring-form cake pan which makes it easy to pop out. I’m having fun trying your recipes and so far they’ve been great! Thanks for doing this website and the YouTube videos. Dear Jenny!!! Thank you so much for this recipe! easy, really easy and delicious!! I have changed a bit the recipe sometimes depending on what I have in the kitchen: sometimes i used 2 tbs of coconut oil, 2 of sesame oil and 2 olive oil. Sometimes just all 6 spoons of regular veg oil. Sometimes, i added a banana into the mix and other nuts… it works great everytime!! I made my first cake using your recipe and im so thankful! now i just want to keep baking! I have never used a pressure pan but I suggest looking at the instructions that came with it (or find them online). See if they have any recipes for cake and you might be able to follow those instructions with my recipe. Secondly, try googling “How to bake a cake in a pressure cooker” and that may help. Third, since I believe you have a stove top, you could also try looking for “stove top cake.” I’m sorry I am not able to help more. I was searching recipe for a cake which I can make with ingredients that I already have at home, without going to the store. And I found it! Cake is just perfect, it’s fluffy, light and of course so delicious. Could you use whole wheat flour instead of all purpose? Or at least substitute a portion of the all purpose? I always use whole wheat flour when it works but for me, it does not work with this cake. I have other cakes where it (whole wheat PASTRY flour) works very well like my carrot cake, oatmeal snacking cake, lemon brownies, and most of my cookies. Instead of olive oil can i use any veg cooking oil? Can I use honey instead of sugar for this recipe? I don’t think so. You’d be better off with a different recipe that uses honey. Hi Jenny cool water is room temperature water or cold water??? I would say room temperature, definitely not cold. Just wanted to say how delish and popular the cake is. I was googling recipes for baking without butter, as I have not done the shopping yet, and came across u and this recipe. I followed it exact but used cheap cocoa (I live in NewZealand), it’s amazing. Thank u, you are a life saver. just made your recipe for one bowl choco cake for the second time…no frosting, just toasted almonds and a dusting of powdered sugar…oh and i did add a pinch of cinnamon and this time some instant expresso…we shall see…have a great day! I’m allergic to eggs, so glad for this recipe. I’ve made this several times. 100% kid approved! Any unsweetened cocoa powder will work but Dutch process cocoa makes a much better cake and it’s worth looking for if you can find it. Jenny, thank you with a grateful heart for sharing good recipes. I love, love this cake recipes! Just one question here. If I don’t do the icing because I can’t take butter. I like to dust it with more coco pwd. When should I dust it, before or after the cake is baked? You would dust it after the cake is baked and cooled. You won’t really see cocoa powder on a brown cake and since the cocoa we use is unsweetened, you can use powdered sugar or a mixture of powdered sugar and cocoa. Do you think I can sub the baking soda for baking powder? Will it be the same amount? Would I need to add lemon/vinegar as well or omit? No. Baking soda and baking powder are completely different. Since there are no eggs, this cake needs baking SODA, which is acidic, and the lemon/vinegar that it reacts with to make the cake rise. What’s the purpose of the white distilled vinegar? When not using eggs, the vinegar or lemon juice react with the baking soda to give the cake body and rise. Yes, but it’s worth looking for Dutch process cocoa, which is less bitter and has a much better flavor. I got them a long time ago online and don’t remember where – sorry. This recipe is fantastic! Thanks so much for posting these delicious and healthier versions of wonderful recipes!! Can I use coconut oil for the batter, or will it taste like coconut. Coconut oil does not taste like coconut and can be used in lots of baking. I tried it without the frost and my cousins love it, me too of course 😉 . It was delicious. Thanks a lot for sharing your recipes. Jenny, I was wondering if you left the cocoa powder out can you make a simple white cake? I think you could. I am planning to try that this week. I would increase the flour by 3 tablespoons and I would white vinegar rather than lemon juice. I tried it without the cocoa to make a white cake and it does not work. The taste and texture were both off so it’s best to keep this as is – a delicious chocolate cake. Hi Jenny! My sister and I have been watching your videos for a while, and while she is a great cook, I am unfortunately not gifted with that talent in the family. However, for Fourth of July, I was very motivated to make this chocolate cake. Everyone loved it so much, that they asked me to bake it the next day! So, this is the second day that I have been making this cake, and with the same result as yesterday. Thank you so much for your work that you put into your videos. It’s very appreciated! Hi Jenny!i just try that chocolate cake of you and,i find it delicious,thank you so much. Jenny, I use your site and many of your recipes….the chocolate cake….was such a hit with the children last night….Made it and put the icing recipe on ….then, put sprinkles and tiny M&Ms….just love your videos….so imformative….thanks! Can u use pastery flour when baking cakes or muffins instead of all purpose flour? I would not recommend pastry flour (I assume you mean the fine cake flour) unless a recipe specifically calls for it. I made your cake after watching the video and it was excellent! My husband said that was the best chocolate cake he’s had in a long while. Also like the smaller size, which still allowed me to freeze a few pieces for next week. Thanks Jenny, that’s another 5-star recipe! I would not recommend pastry flour for this recipe – it may not have enough body for this cake. With baking it’s best to try to stick to the recipe exactly. I have made this cake, but it seem abit hard, isn’t the way it is? Or am I doing something wrong? I follow all the instructions , it’s very moist that’s true.. This cake should not be hard at all. If it’s soft in the middle and hard on the outside, it could be your oven was too hot or you baked it too long. That might also happen if you use a dark colored cake pan which absorbs more heat than a light colored pan. Also a glass pan might be the problem. When you bake in glass you should reduce the oven temperature by 25 degrees F.
I was using the light color cake pan and follow your time 30mins, or isn’t my oven is smaller than yours, so isn’t have to reduce the timing? Rather than reduce the cooking time, I would start checking at 20 minutes and again at 25 minutes. You can do this with a toothpick or a piece of spaghetti. Stick it in the middle of the cake and if it comes out clean, the cake is done. What would be a good distilled white vinegar substitute? Fresh lemon juice works just as well. In fact, I just added it to the recipe since most people may not have distilled vinegar. Would it be possible to make this cake in another type of pan? I have made it in my 8 x 8-inch square pan. Jenny, first of all, I LOVE your recipes! This cake is the same recipe I learned many years ago as a child from my grandmother. We called it 3 Hole Cake. We doubled the ingredients, first putting all the dry ingredients in a ungreased 9 x 13 pan. Then, you put 3 “holes” in the mixture, and put the oil in one, the vinegar in another, and the vanilla in the last. Finally you pour the water over it all and mix. Bake, and voila! A very moist tasty cake. A super easy recipe to do with small children. Thanks so much for posting it. It brought back fond memories. I might even make this today! I love your videos and your always pretty & very funny,Thank-You:) Keep it up!!!! This cake look’s yummy! I will be making this cake next week. Where can I find Dutch Processed cocoa? I checked Walmart and Publix but didn’t see it. I am not sure if there is a certain aisle where they would keep it, I only saw Hersheys cocoa. You might find it at World Market or Trader Joe’s or possibly a high end grocery store (it’s usually in the baking aisle). If not, you can probably find it online. Thank you so much! I can’t wait to try the chocolate cake. I am sure it will taste as good as it looks. I was at World Market today and they had it but it’s not in the baking section, only in the hot chocolate section. So if you go, please ask for it – each store may have it someplace different.